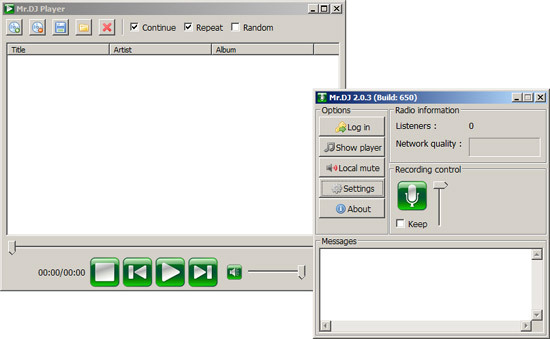 Mr.DJ is an online broadcasting software application developed by Now.in, that allows you to build an Internet radio station in just a few steps. By using Mr.DJ, you can pre-record an internet radio show or broadcast your voice to the world in real-time. Image A-1: Mr.DJ 2.0.3 has a friendly user interface. This software is the most easy-to-use than any other similar software I have seen, the user interface is very friendly to computer beginners as well, and, it is free. The best online broadcasting software in the world. The direct download links are official and the default language depends on your system language, we usually provide the latest version of them, if you need to read more information about Mr.DJ, please visit the official Mr.DJ download page. After having installed Mr.DJ, simply sign up for a Now.in account, and then login to your account, modify the information of your radio station. Just a few steps, your own Internet station is complete.